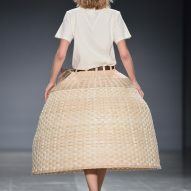 This year's graduates from the Pratt Institute department of fashion presented collections that included a structured wicker skirt and oversized soft rabbits in New York last week. 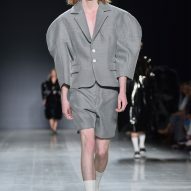 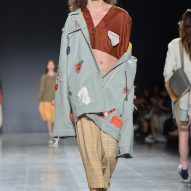 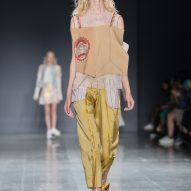 Pratt's annual catwalk show took place 3 May 2018 at Spring Studios in Tribeca, when 20 students selected from the graduating class sent their designs down the runway, as part of the institute's series of end-of-year exhibitions. 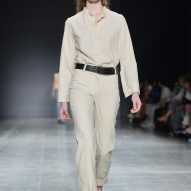 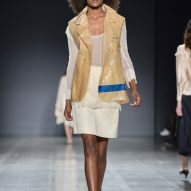 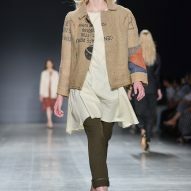 The theme of this year's presentation was Diversiform, and many collections included a mix of mens, womens and gender-neutral ensembles. 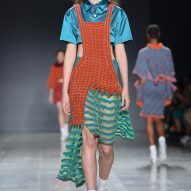 The designs were worn by a refreshingly, racially diverse selection of models – a topic that the fashion industry in general is finally aiming to address. 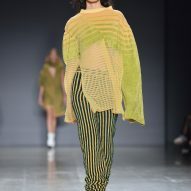 Jessica Stahl predominantly focussed on knitwear, using a 1970s-inspired silhouettes and colours – like burnt orange, bright yellow and dark green – to create a cohesive and wearable collection. 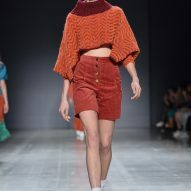 The designer experimented with various techniques to create checked, waved and striped patterns on tops with high necks and flared sleeves, which were paired with high-waisted bottoms. 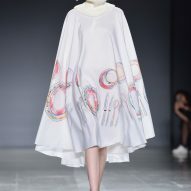 Rachel Lee illustrated some of her garments with colourful drawings, using the white fabrics as canvases for simple pictures of home interiors and dinner table settings. 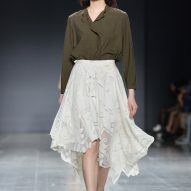 Other apparel featured intricately patterned lace and gingham cloth that also evoked imagery associated with domesticity. 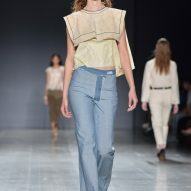 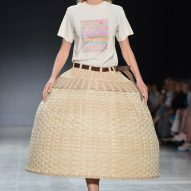 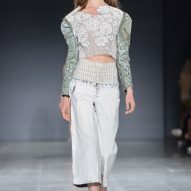 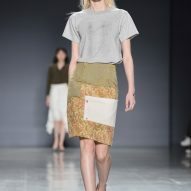 A huge wicker basket worn upside-down as a skirt rounded off Emily Ridings' country and western-influenced collection, which also included plenty of denim and lots of earthy tones. 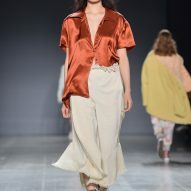 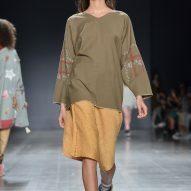 Flowing, feminine shirts and shirts gave the impression of a sophisticated and contemporary take on Little House on the Prairie. 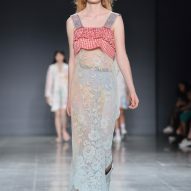 Pastel tones ran through the series of long dresses and capes created by Amy Sullivan, who combined several knitting and crochet techniques to form textured and multi-coloured designs. 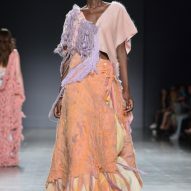 The standout piece was a cape made from loose knots of thick, pink wool fibres that looked like dreadlocks trailing behind the model. 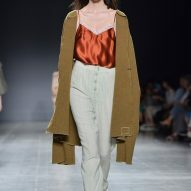 From Anderson Osmun, the highlights were satin tops in rusty red and a dress of the same material in olive green. 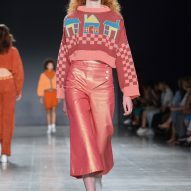 The later was shown with a shimmering pink coat decorated with wide stripes and floral details, matching embroidery found on other garments across his set. 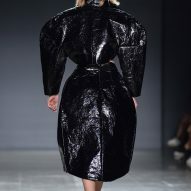 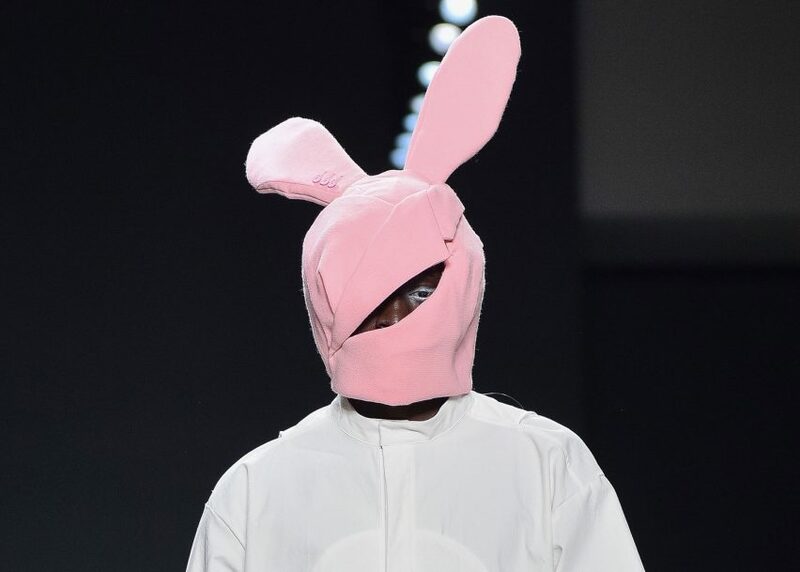 Qian Wu's collection was accessorised by soft-toy rabbits – from a small handheld version to a giant furry bunny carried over a model's shoulder. 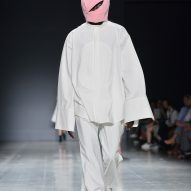 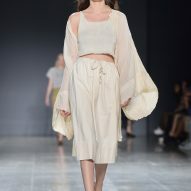 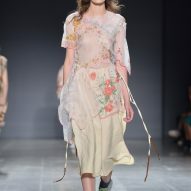 One of the models was even dressed like a rabbit, wearing a pale pink headpiece complete with floppy ears, as part of a range of garments that contrasted light and dark colours, and materials of varying opacities and sheens. 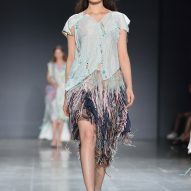 Photography is by Fernando Colon.